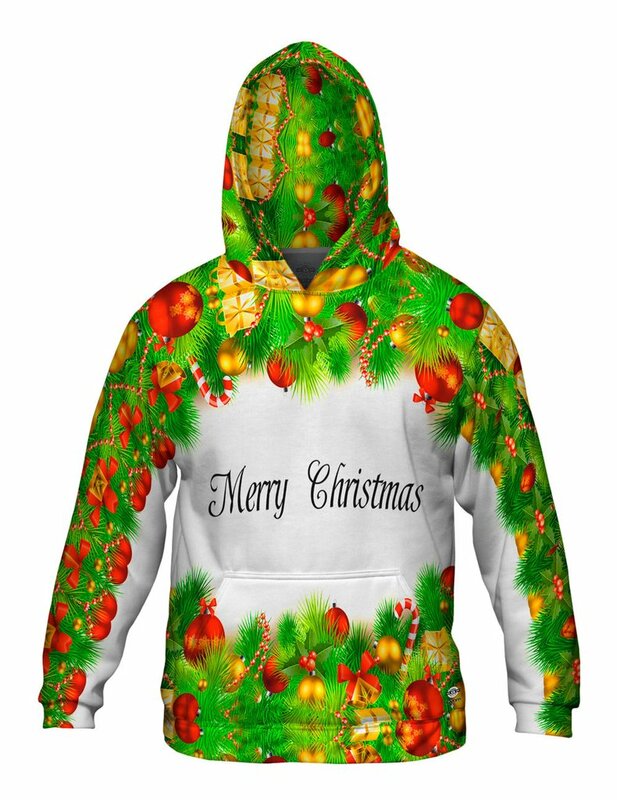 Douglas Fir, White Pine, Norway Spruce, Tannenbaum, or just plain Christmas Tree, there are as many names for it as there are ways to decorate it. Gone are the days of a strand of lights, a few bulbs, treasured ornaments and a handful of tinsel. Modern traditions mean trees are made out of everything from Coca-Cola bottles and beer cans to upside down versions hanging from the ceiling. Anything goes these days. That’s why we couldn’t resist checking out some of the weirdest, oddest, craziest and best trees that make the season bright. Here are a few of the wackiest branches around. Love Legos as a kid? Finding them all over your house (and stepping on them!) now that you have kids of your own? Whether you love them or hate them, this one might seem especially impressive to those who can barely follow the directions to make a simple Lego car or house. 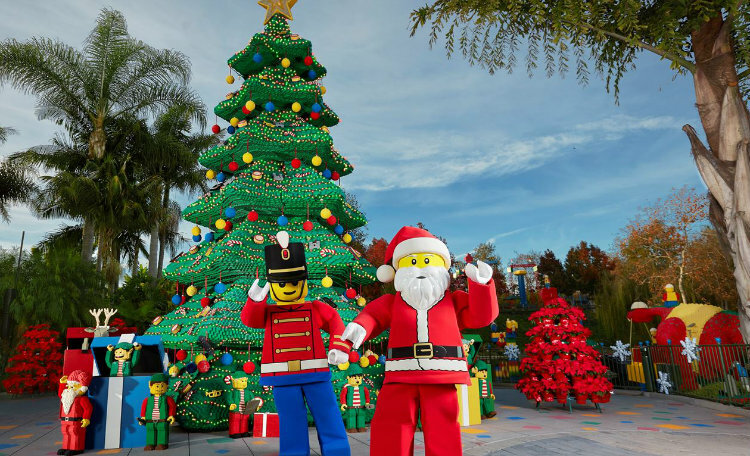 Made from a quarter million dark forest green Dupo bricks, this tree at the LegoLand in Carlsbad, California is their most festive display. Sitting at over 30 feet tall, it is accompanied by a life-size sleigh, jolly Santa and his reindeer – of course all are made from Legos. Already blinking a bright red and green, it only makes sense to get the stoplights involved in the holiday magic. 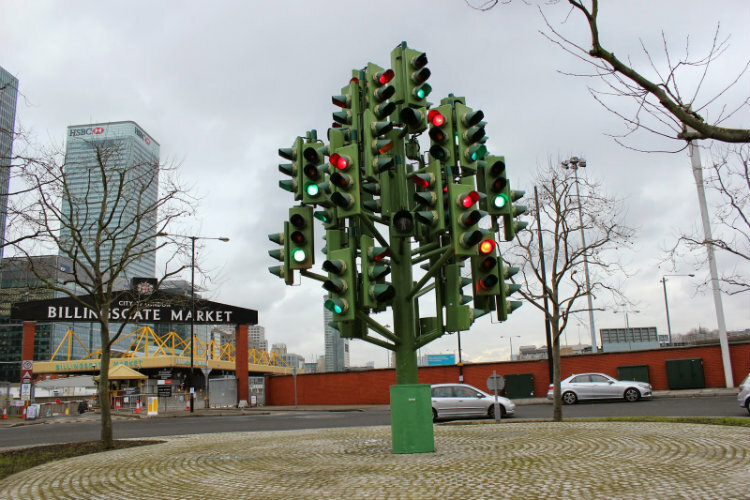 At least that must have been what French sculptor Pierre Vivant, was thinking when he created the “Traffic Light Tree.” Originally near London’s Canary Wharf at the roundabout, this 26-feet-tall masterpiece incorporating 75 sets of traffic lights was moved to a nearby roundabout at Billingsgate Market. 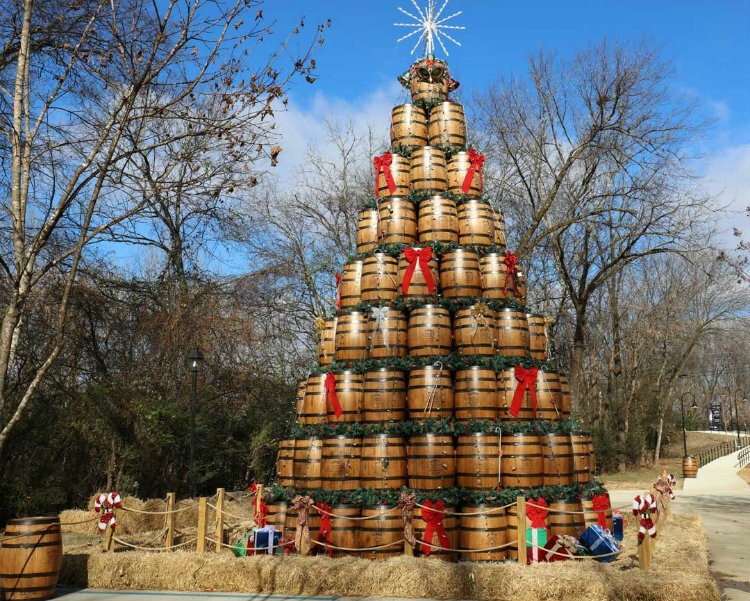 The folks in Lynchburg, Tennessee are all about making the holidays a barrel of fun – literally. The 26-food-tall Jack Daniels’ Barrel Tree is exactly what it sounds like. Crafted from approximately 140 empty, 53-gallon Jack Daniel’s whisky barrels, this tree takes about a week to put together each year. With the help of a heavy-duty loader and a bunch of fans, this tradition is here to stay. 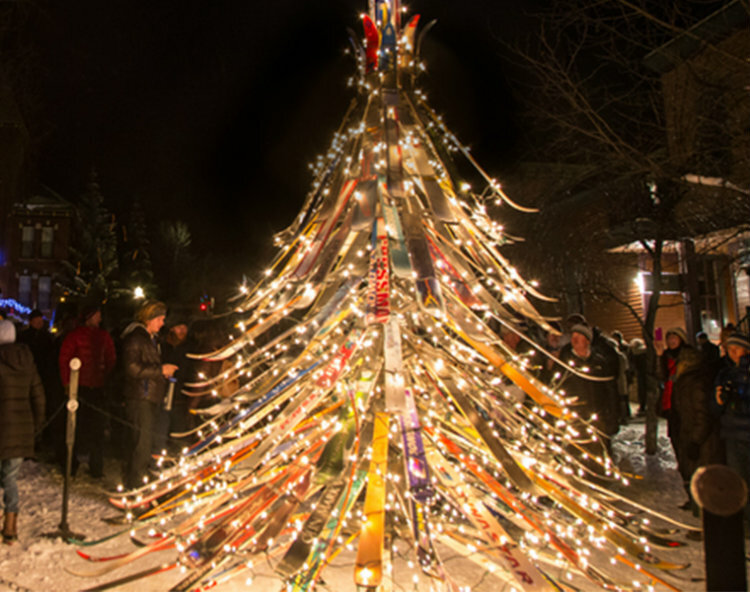 Betcha didn’t know you could make a Christmas tree out of skis. That’s okay, we didn’t either! But local metal artist Anton Viditz-Ward in Telluride, Colorado was up for the challenge. His “Ski tree” stands 17-feet tall and is made from donate skis. The star at the top is crafted from, you guessed it, ski poles! A homage just as much to snow sports as it is to the holiday season, this tree is a local favorite with a Facebook fan page of its own. Who says you need a physical tree at all? The people of Amsterdam could argue that their 24-foot-tall shape-shifting Christmas tree is every bit as good as the real thing. 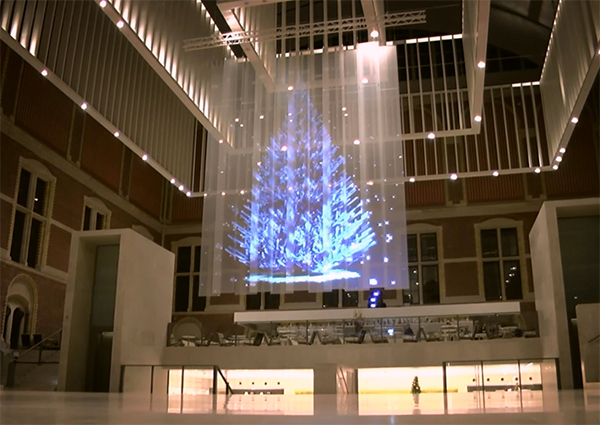 Standing tall, er, virtually standing, in the atrium at the Rijksmuseum, this hologram was designed in part by Beambrothers, a company specializing in “high end projection.” It is played on a loop above tourists’ heads as it changes colors, rotates and even shakes loose in the wind. Just think of the after-holiday cleanup for that one – a real breeze! Move over pine, poinsettias are the star of the show here. 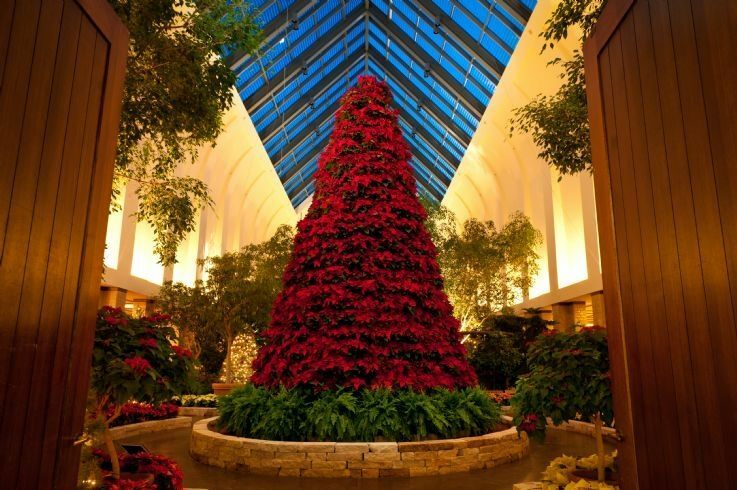 For nearly 20 years, Lauritzen Gardens in Omaha has crafted a 20-foot-tall tree made from poinsettias – complete with lights. Starting in July, the gardeners plant more than 5,000 poinsettia cuttings in their greenhouse in order to compose the tree made from 720 potted poinsettias. They are replaced after a week or two with fresh flowers in order to maintain the look, color, bloom and texture. Snaking around the tree is a model train and dozens of adorable miniature landmarks local to Omaha. 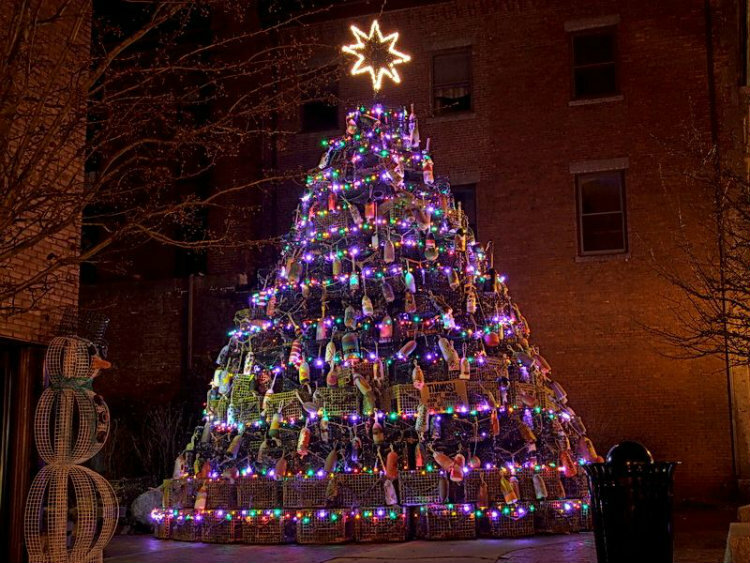 Sure, Maine is known for their lobster, but have you seen their Christmas tree? For 15 years the famous Lobster Trap Christmas Tree has been erected in downtown Rockland. 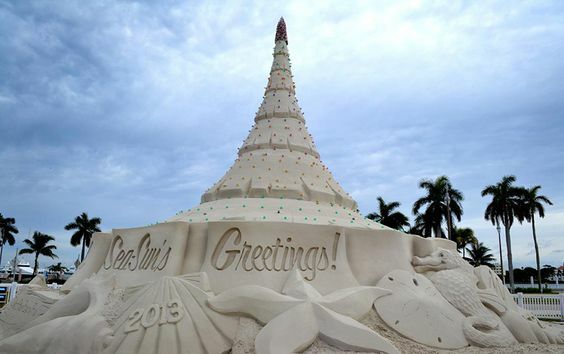 The 40-foot-tall tree is made from 154 lobster traps and created with the help of about 30 volunteers each year. Bursting with holiday spirit and hometown pride, this tree is the largest of its kind in the world (could there really be another one?) and a holiday selfie destination for locals and tourists alike. One person’s junk is another person’s treasure – or holiday decoration, as the case may be for this oddly festive tree. 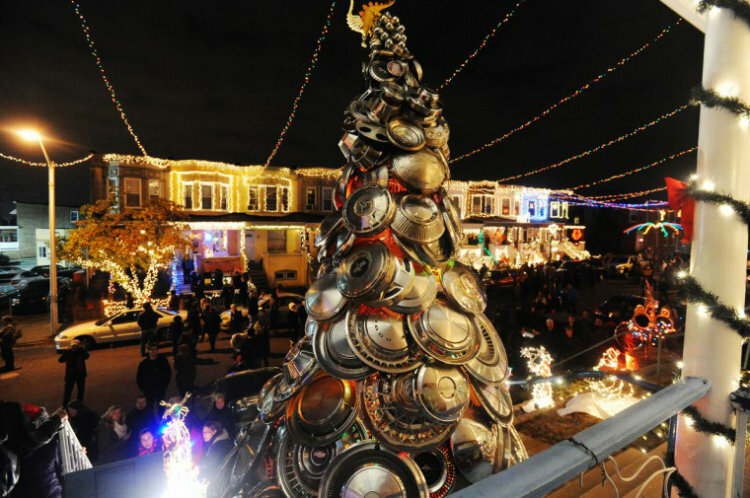 Ten feet tall and made from 100 hubcaps this tree delights tourists year after year on 34th street (a miracle!) between Keswick Road and Chestnut Avenue. A tradition for over 20 years, the original tree stood just 3-feet-tall and has grown every year since. It’s a real beauty! 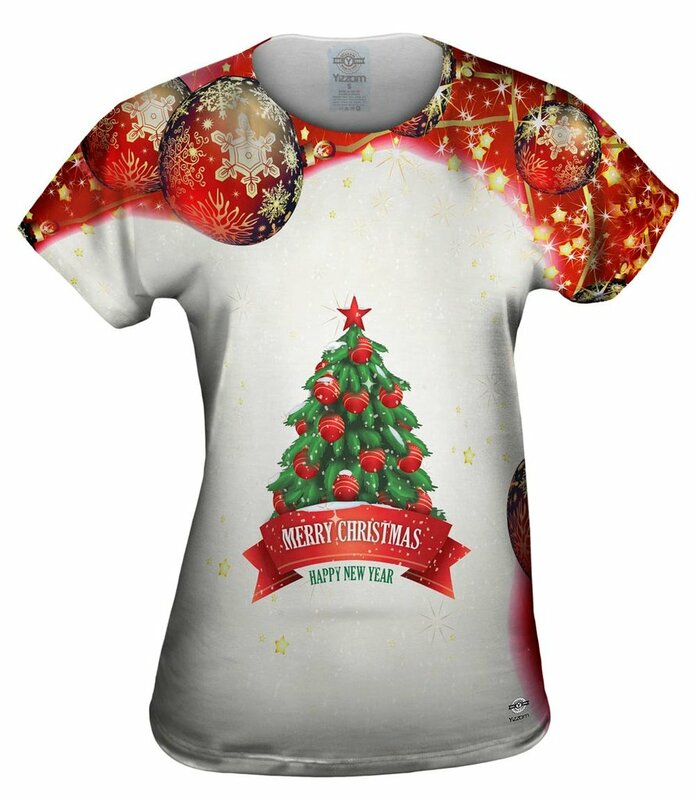 Of course, what’s a crazy Christmas tree without an all over print t-shirt or sweater to match? These are a few of our irrisistable holiday favorites. 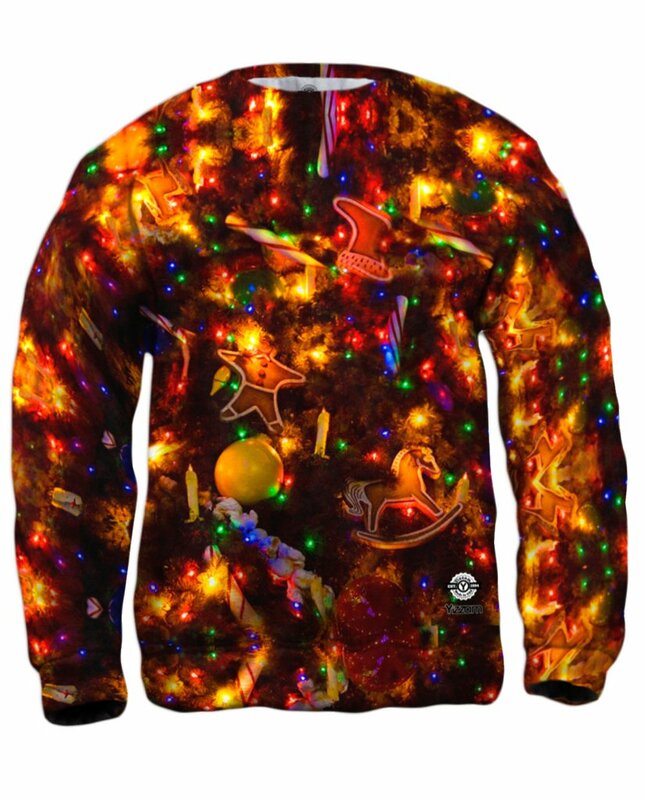 Check out some of these equally crazy Christmas themed items from Yizzam. 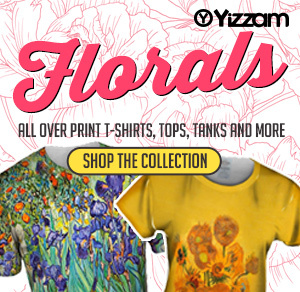 From now through the holidays get up to 30% off on any all over printed apparel from Yizzam. Shop art, science, animals, humor, food and much much more.